We are glad to present you our new free 3D screensaver of our own design! 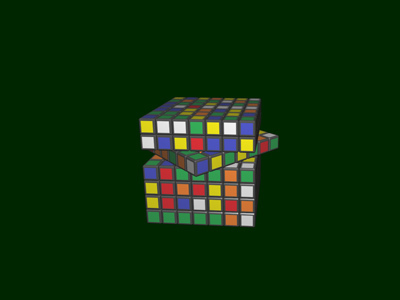 This time you will see a multicolored 3D Rubik\'s cube in size of 5x5x5. We are glad to present you our new free 3D screensaver of our own design! This time you will see a multicolored 3D Rubik\'s cube in size of 5x5x5. First of all, it is rapidly mixed in three dimensions. And then starts to gently gather in the original form! So that you can view it from all the angles while it moves in space and bounces off imaginary planes. We have added lights, perspective and reflection for more realism. The process is different every time and never repeats! That\'s why, you can observe the cube for a very long time. This will help you to relax of your hard days problems! This free 3D screensaver is compact size and installs very fast. Download it today absolutely free and you will not regret it for sure!